What Is the Difference Between Indoor Cockroaches & Water Bugs? Cockroaches make your stomach churn, but water bugs not so much? You won't like knowing, then, that water bugs are cockroaches. Both the cockroaches found indoors and the nocturnal water bugs roaming outdoors are members of taxonomic order Blattellidae, which has more than 3,500 known species of cockroaches. Fifty of those live in North America. Roaches frequently found inside North American homes include the German cockroach (Blattella germanica) and brown-banded cockroach (Supella longipalpa). Known by the common name water bug, the American cockroach (Periplaneta americana) and Oriental cockroach (Blatta orientalis) are thought of as outdoor bugs, although they may also come into your home. While the German, American and Oriental cockroaches' names are associated with specific locations, their true origins are entirely different. The German cockroach species began its worldwide journey in Southeast Asia, while the American and Oriental cockroaches originated in Africa. The brown-banded cockroach is believed to have originated in Africa. While the German and brown-banded cockroaches prefer to live inside your home where it's warm and dry, water bugs such as the American and Oriental cockroaches are attracted to dark, moist, humid conditions, like those found in sewers, under sinks, around drainpipes and in water meter boxes. Nearly all cockroaches prefer warm temperatures, between 70 and 85 degrees Fahrenheit, although the Oriental cockroach tolerates cooler temperatures better than other species. Cockroaches can hide in cracks as small as one-sixteenth-inch wide, squeezing in during the day and coming out at night to forage for crumbs, pet food, soap, book bindings and other organic matter. Cockroaches and water bugs are distinguished in North America by their differences in size. Generally, indoor cockroach species are smaller than water bugs, which are considered outdoor bugs. The German and brown-banded cockroaches are a half-inch long, while the Oriental cockroach is 1 1/4 inches long and the American cockroach grows up to 2 inches long. While the thought of a 2-inch-long cockroach may be horrifying, it's not the largest cockroach in the world. Among the largest species is the Madagascar hissing cockroach (Gromphadorhina portentosa) native to Madagascar, which grows 2 to 4 inches long and is kept as a pet. While water bugs are often treated in a casual manner, you should be concerned if they've moved in with you. 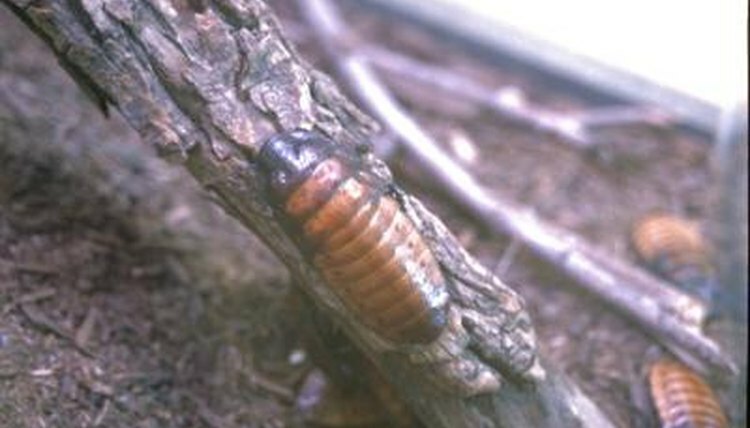 American and Oriental cockroaches are exposed to sewage in and around the moist environment of drainage pipes and sinks. They can transport bacteria such as salmonella (Salmonella spp.) and shigellosis (Shigella spp.) which cause severe gastrointestinal distress and, in some cases, death. Meanwhile, German cockroaches also transmit bacterial and viral diseases such as staph (Staphylococcus spp. ), strep (Streptococcus spp.) and typhoid (Salmonella Typhi). In addition, cockroach droppings cause allergic reactions in sensitive individuals and may trigger asthma symptoms. Cornell University New York State Integrated Pest Management Program: Which One Is It? Where Do Roaches Go During the Day? Why Do Pill Bugs Prefer Moist Environments? What Do Water Lice Eat?